Since crizzled glass was a standard feature of imperial production in its early phase, we may assume this to be a likely imperial product. As to its period, it is likely to be relatively early, perhaps from the late Kangxi, the Yongzheng, or the early Qianlong reign. The crizzling is relatively light compared to some known very early glass from the imperial glassworks, and also free from the associated problem of sweating. The crizzling here is also spread evenly over both interior and exterior surfaces, not often the case with snuff bottles, where sometimes the inner surface alone seems to be affected. 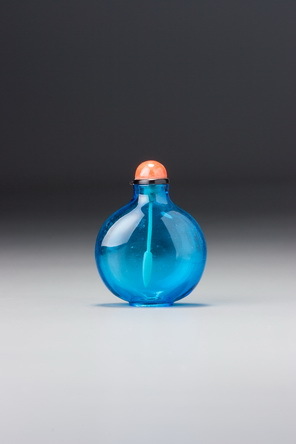 Apart from the warm glow imparted by the knowledge that we have here a plain glass bottle that may be dated to the earlier part of glass production with reasonable confidence, we can tentatively establish certain details as denoting imperial style for this period. Such details, while neither consistent across the entire range of products nor exclusive to this time and place, represent a start. One of the useful lessons we can learn from this example is that a glass bottle featuring a recessed convex foot is likely to form part of early glass production. This compressed spherical form, together with the flared neck, flat lip, and neatly carved, rounded, oval footrim may all be noted as probable early features of the imperial glassworks. In view of its implications in terms of age and imperial stature, crizzling is much appreciated among glass collectors, despite often being referred to as ‘glass disease,’ for we tend to be forgiving of an ailment that massages our egos a little, materially or academically. It certainly adds irresistibly to the appeal of this bottle, with its unusual and lovely colour, and impeccable formal integrity.